This article is about the star in the Alpha Centauri system. For other uses, see Proxima Centauri (disambiguation). Robert Thorburn Ayton Innes FRSE FRAS was a Scottish astronomer best known for discovering Proxima Centauri in 1915, and numerous binary stars. He was also the first astronomer to have seen the Great January Comet of 1910, on 12 January. He was the founding director of a meteorological observatory in Johannesburg, which was later converted to an astronomical observatory and renamed to Union Observatory. He was the first Union Astronomer. Innes House, designed by Herbert Baker, built as his residence at the observatory, today houses the South African Institute of Electrical Engineers. 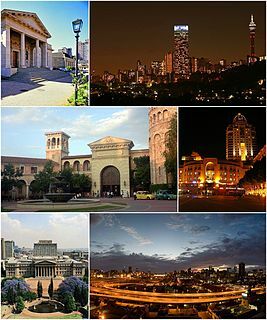 Union Observatory also known as Johannesburg Observatory (078) is a defunct astronomical observatory in Johannesburg, South Africa that was operated between 1903 and 1971. It is located on Observatory Ridge, the city's highest point at 1,808 metres altitude in the suburb Observatory. Harlow Shapley was an American scientist, head of the Harvard College Observatory (1921–1952), and political activist during the latter New Deal and Fair Deal. A flare star is a variable star that can undergo unpredictable dramatic increases in brightness for a few minutes. It is believed that the flares on flare stars are analogous to solar flares in that they are due to the magnetic energy stored in the stars' atmospheres. The brightness increase is across the spectrum, from X rays to radio waves. The first known flare stars were discovered in 1924. However, the best-known flare star is UV Ceti, discovered in 1948. Today similar flare stars are classified as UV Ceti type variable stars in variable star catalogs such as the General Catalogue of Variable Stars. Einstein Observatory (HEAO-2) was the first fully imaging X-ray telescope put into space and the second of NASA's three High Energy Astrophysical Observatories. Named HEAO B before launch, the observatory's name was changed to honor Albert Einstein upon its successfully attaining orbit. This illustration shows the comparative sizes of (from left to right) the Sun, α Centauri A, α Centauri B, and Proxima Centauri. The two bright points are the Alpha Centauri system (left) and Beta Centauri (right). The faint red star in the centre of the red circle is Proxima Centauri. Distances of the nearest stars from 20,000 years ago through 80,000 years in the future. Proxima Centauri is in yellow. Orbital plot of Proxima Centauri as presently seen from Earth. Six single stars, two binary star systems, and a triple star share a common motion through space with Proxima Centauri and the Alpha Centauri system. The space velocities of these stars are all within 10 km/s of Alpha Centauri's peculiar motion. 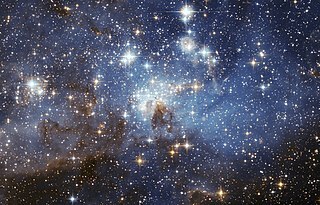 Thus, they may form a moving group of stars, which would indicate a common point of origin,  such as in a star cluster. Pale Red Dot is an international search for an Earth-like exoplanet around the closest star Proxima Centauri. The Sun as seen from the Alpha Centauri system, using Celestia. Munsell, Kirk; Smith, Harman; Davis, Phil; Harvey, Samantha (June 11, 2008). "Sun: facts & figures". Solar system exploration. NASA. Archived from the original on January 2, 2008. Retrieved July 12, 2008. Bergman, Marcel W.; Clark, T. Alan; Wilson, William J. F. (2007). Observing projects using Starry Night Enthusiast (8th ed.). Macmillan. pp. 220–221. ISBN 978-1-4292-0074-5. Highest latitude = 90° + −62.68° = 27.32°. See: Campbell, William Wallace (1899). The elements of practical astronomy. London: Macmillan. pp. 109–110. Retrieved August 12, 2008. ↑ Note that by the time Proxima gets to the 40,000-year mark, the entire Alpha Centauri system will have moved to another part of the sky, so the perspective and background will be different. ↑ Pale Red Dot is a reference to Pale Blue Dot, a distant photo of Earth taken by Voyager 1. ↑ This is actually an upper limit on the quantity m sin i, where i is the angle between the orbit normal and the line of sight, in a circular orbit. If the planetary orbits are close to face-on as observed from Earth, or in an eccentric orbit, more massive planets could have evaded detection by the radial velocity method. ↑ The coordinates of the Sun would be diametrically opposite Proxima, at α= 02h 29m 42.9487s, δ=+62° 40′ 46.141″. The absolute magnitude Mv of the Sun is 4.83, so at a parallax π of 0.77199 the apparent magnitude m is given by 4.83 − 5(log10(0.77199) + 1) = 0.40. See: Tayler, Roger John (1994). The Stars: Their Structure and Evolution. Cambridge University Press. p. 16. ISBN 978-0-521-45885-6. Alpha Centauri is the closest star system and closest planetary system to the Solar System at 4.37 light-years (1.34 pc) from the Sun. It is a triple star system, consisting of three stars: α Centauri A, α Centauri B, and α Centauri C.
Barnard's Star is a very-low-mass red dwarf about 6 light-years away from Earth in the constellation of Ophiuchus. It is the fourth nearest known individual star to the Sun and the closest star in the Northern Celestial Hemisphere. Despite its proximity, the star has a dim apparent magnitude of +9.5 and is invisible to the unaided eye; it is much brighter in the infrared than in visible light. Lalande 21185 is a star in the constellation of Ursa Major, relevant for being the brightest red dwarf observable in the northern hemisphere. Despite this, and although relatively close by, it is very dim, being only magnitude 7.5 in visible light and thus too dim to be seen with the unaided eye. The star is visible through a small telescope or binoculars. Ross 248, also called HH Andromedae or Gliese 905, is a small star located approximately 10.30 light-years from Earth in the northern constellation of Andromeda. Despite its proximity to the Earth, this star is too dim to be seen with the naked eye. Ross 248 was first catalogued by Frank Elmore Ross in 1926 with his second list of proper-motion stars. In the SIMBAD database it is the 261st-highest proper-motion star. It was too dim to be included in the Hipparcos survey. Kapteyn's Star is a class M1 red subdwarf about 12.76 light years from Earth in the southern constellation Pictor; it is the closest halo star to the Solar System. With a magnitude of nearly 9 it is visible through binoculars or a telescope. 40 Eridani, also designated Omicron² Eridani, is a triple star system in the constellation of Eridanus. Based on parallax measurements taken during the Hipparcos mission, it is less than 17 light-years from the Sun. 82 G. Eridani is a star about 20 light years away from Earth in the constellation Eridanus. It is a main-sequence star with a stellar classification of G6. Gliese 436 is a red dwarf approximately 31.8 light-years away in the zodiac constellation of Leo. It has an apparent visual magnitude of 10.67, which is much too faint to be seen with the naked eye. However, it can be viewed with even a modest telescope of 2.4 in (6 cm) aperture. In 2004, the existence of an extrasolar planet, Gliese 436b, was verified as orbiting the star. This planet was later discovered to transit its host star. 54 Piscium is an orange dwarf star approximately 36 light-years away in the constellation of Pisces. In 2002, an extrasolar planet was confirmed to be orbiting the star, and in 2006, a brown dwarf was also discovered orbiting it. HD 114729 is a 7th magnitude star approximately 118 ly (36.1 pc) away in the constellation of Centaurus. Like our Sun (G2V), it is a yellow dwarf. It is about the same mass as the Sun, but twice as luminous. That indicates a much greater age, perhaps over 10 billion years. HD 114729 has a co-moving companion designated HD 114729 B, with the latter having 25.3% of the Sun's mass and a projected separation of 282±10 AU. Solar-type star, solar analogs, and solar twins are stars that are particularly similar to the Sun. 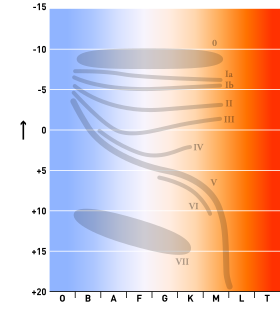 The stellar classification is a hierarchy with solar twin being most like the Sun followed by solar analog and then solar-type. Observations of these stars are important for understanding better the properties of the Sun in relation to other stars and the habitability of planets. Gliese 1 is a red dwarf in the constellation Sculptor, which is found in the southern celestial hemisphere. It is one of the closest stars to the Sun, at a distance of 14.2 light years. Because of its proximity to the Earth it is a frequent object of study and much is known about its physical properties and composition. However, with an apparent magnitude of about 8.5 it is too faint to be seen with the naked eye. Kappa1 Ceti is a yellow dwarf star approximately 30 light-years away in the equatorial constellation of Cetus. The star was discovered to have a rapid rotation, roughly once every nine days. Though there are no extrasolar planets confirmed to be orbiting the star, Kappa1 Ceti is considered a good candidate to contain terrestrial planets. The system is a candidate binary star, but has not been confirmed. The star should not be confused with the star Kappa2 Ceti, which is ten times as distant. Luhman 16 is a binary brown-dwarf system in the southern constellation Vela at a distance of approximately 6.5 light-years from the Sun. These are the closest-known brown dwarfs and the closest system found since the measurement of the proper motion of Barnard's Star in 1916, and the third-closest-known system to the Sun. The primary is of spectral type L7.5 and the secondary of type T0.5 ± 1. The masses of Luhman 16 A and B are 33.5 and 28.6 Jupiter masses, respectively, and their ages are estimated to be 600–800 million years. Luhman 16 A and B orbit each other at a distance of about 3.5 astronomical units with an orbital period of approximately 27 years. Mikko Tuomi is a Finnish astronomer from the University of Hertfordshire, most known for his contributions to the discovery of a number of exoplanets, among them the Proxima Centauri b which orbits the closest star to the Sun. Mikko Tuomi was the first to find indications of the existence of Proxima Centauri b in archival observation data. Other exoplanets to whose discovery or study Tuomi has contributed include HD 40307, HD 154857 c, Kapteyn c, Gliese 682 c, HD 154857, Gliese 221, Gliese 581 g and the planetary system orbiting Tau Ceti. He has led the development of new data analysis techniques for distinguishing observations caused by natural activity of the star and those caused by planets orbiting them. 1 2 Stevenson, Angus, ed. (2010), Oxford Dictionary of English, OUP Oxford, p. 1431, ISBN 978-0199571123. Jones, Daniel (2011). Roach, Peter; Setter, Jane; Esling, John (eds.). Cambridge English Pronouncing Dictionary. Cambridge University Press. p. 16. ISBN 978-0521152556. 1 2 3 4 Van Leeuwen, F. (2007). "Validation of the new Hipparcos reduction". Astronomy and Astrophysics. 474 (2): 653–664. arXiv: 0708.1752 . Bibcode:2007A&A...474..653V. doi:10.1051/0004-6361:20078357. 1 2 Samus, N. N.; Durlevich, O. V.; et al. (2009). "VizieR online data catalog: General catalogue of variable stars (Samus+ 2007–2013)". VizieR On-line Data Catalog: B/gcvs. Originally Published In: 2009yCat....102025S. 1. Bibcode:2009yCat....102025S. ↑ Bessell, M. S. (1991). "The late-M dwarfs". The Astronomical Journal. 101: 662. Bibcode:1991AJ....101..662B. doi:10.1086/115714. 1 2 3 4 5 6 Jao, Wei-Chun; Henry, Todd J.; Subasavage, John P.; Winters, Jennifer G.; Gies, Douglas R.; Riedel, Adric R.; Ianna, Philip A. (2014). "The Solar neighborhood. XXXI. Discovery of an unusual red+white dwarf binary at ~25 pc via astrometry and UV imaging". The Astronomical Journal. 147 (1): 21. arXiv: 1310.4746 . Bibcode:2014AJ....147...21J. doi:10.1088/0004-6256/147/1/21. ISSN 0004-6256. 1 2 3 Cutri, R. M.; Skrutskie, M. F.; Van Dyk, S.; Beichman, C. A.; Carpenter, J. M.; Chester, T.; Cambresy, L.; Evans, T.; Fowler, J.; Gizis, J.; Howard, E.; Huchra, J.; Jarrett, T.; Kopan, E. L.; Kirkpatrick, J. D.; Light, R. M.; Marsh, K. A.; McCallon, H.; Schneider, S.; Stiening, R.; Sykes, M.; Weinberg, M.; Wheaton, W. A.; Wheelock, S.; Zacarias, N. (2003). "VizieR online data catalog: 2MASS all-sky catalog of point sources (Cutri+ 2003)". VizieR On-line Data Catalog: II/246. Originally Published In: 2003yCat.2246....0C. 2246: 0. Bibcode:2003yCat.2246....0C. 1 2 3 4 5 6 7 8 9 10 Kervella, P.; Thévenin, F.; Lovis, C. (2017). "Proxima's orbit around α Centauri". Astronomy & Astrophysics. 598: L7. arXiv: 1611.03495 . Bibcode:2017A&A...598L...7K. doi:10.1051/0004-6361/201629930. ISSN 0004-6361. Separation: 3.1, left column of page 3; Orbital period and epoch of periastron: Table 3, right column of page 3. 1 2 3 Brown, A. G. A.; et al. (Gaia collaboration) (August 2018). "Gaia Data Release 2: Summary of the contents and survey properties". Astronomy & Astrophysics . 616. A1. arXiv: 1804.09365 . Bibcode: 2018A&A...616A...1G . doi: 10.1051/0004-6361/201833051 . 1 2 3 Benedict, G. Fritz, Chappell DW, Nelan E, Jefferys WH, Van Altena W, Lee J, Cornell D, Shelus PJ (1999). "Interferometric astrometry of Proxima Centauri and Barnard's Star using Hubble Space Telescope fine guidance sensor 3: detection limits for substellar companions". The Astronomical Journal. 118 (2): 1086–1100. arXiv: astro-ph/9905318 . Bibcode:1999AJ....118.1086B. doi:10.1086/300975. 1 2 See Table 1, Doyle, J. G.; Butler, C. J. (1990). "Optical and infrared photometry of dwarf M and K stars". Astronomy and Astrophysics. 235: 335–339. Bibcode:1990A&A...235..335D. and p. 57, Peebles, P. J. E. (1993). Principles of physical cosmology. Princeton, New Jersey: Princeton University Press. ISBN 978-0-691-01933-8. 1 2 3 Collins, John M.; Jones, Hugh R. A.; Barnes, John R. (June 2017). "Calculations of periodicity from Hα profiles of Proxima Centauri". Astronomy & Astrophysics. 602. A48. arXiv: 1608.07834 . Bibcode:2017A&A...602A..48C. doi:10.1051/0004-6361/201628827. See section 4: "the vsini is probably less than 0.1 km/s for Proxima Centauri". 1 2 3 4 5 Kervella, Pierre; Thevenin, Frederic (March 15, 2003). "A family portrait of the Alpha Centauri system: VLT interferometer studies the nearest stars". ESO. Retrieved May 10, 2016. 1 2 "SIMBAD query result: V* V645 Cen – Flare Star". SIMBAD. Centre de Données astronomiques de Strasbourg. Retrieved August 11, 2008. —some of the data is located under "Measurements". 1 2 Kirkpatrick JD, Davy J, Monet DG, Reid IN, Gizis JE, Liebert J, Burgasser AJ (2001). "Brown dwarf companions to G-type stars. I: Gliese 417B and Gliese 584C". The Astronomical Journal. 121 (6): 3235–3253. arXiv: astro-ph/0103218 . Bibcode:2001AJ....121.3235K. doi:10.1086/321085. ↑ Christian, D. J.; Mathioudakis, M.; Bloomfield, D. S.; Dupuis, J.; Keenan, F. P. (2004). "A detailed study of opacity in the upper atmosphere of Proxima Centauri". The Astrophysical Journal. 612 (2): 1140–1146. Bibcode:2004ApJ...612.1140C. doi:10.1086/422803. 1 2 Wood, B. E.; Linsky, J. L.; Müller, H.-R.; Zank, G. P. (2001). "Observational estimates for the mass-loss rates of α Centauri and Proxima Centauri using Hubble Space Telescope Lyα spectra" (PDF). The Astrophysical Journal. 547 (1): L49–L52. arXiv: astro-ph/0011153 . Bibcode:2001ApJ...547L..49W. doi:10.1086/318888 . Retrieved July 9, 2007. 1 2 3 Adams, Fred C.; Laughlin, Gregory; Graves, Genevieve J. M. Red dwarfs and the end of the main sequence (PDF). Gravitational collapse: from massive stars to planets. Revista Mexicana de Astronomía y Astrofísica. pp. 46–49. Retrieved June 24, 2008. ↑ Dunkley, J.; Komatsu, E.; Nolta, M. R.; Spergel, D. N.; Larson, D.; Hinshaw, G.; Page, L.; Bennett, C. L.; Gold, B. (2009). "Five-year Wilkinson microwave anisotropy probe (WMAP) observations: data processing, sky maps, and basic results". The Astrophysical Journal Supplement Series. 180 (2): 306–329. arXiv: 0803.0586 . Bibcode:2009ApJS..180..306D. doi:10.1088/0067-0049/180/2/306. 1 2 3 4 5 6 7 Anglada-Escudé, Guillem; Amado, Pedro J.; Barnes, John; Berdiñas, Zaira M.; Butler, R. Paul; Coleman, Gavin A. L.; de la Cueva, Ignacio; Dreizler, Stefan; Endl, Michael; Giesers, Benjamin; Jeffers, Sandra V.; Jenkins, James S.; Jones, Hugh R. A.; Kiraga, Marcin; Kürster, Martin; López-González, Marίa J.; Marvin, Christopher J.; Morales, Nicolás; Morin, Julien; Nelson, Richard P.; Ortiz, José L.; Ofir, Aviv; Paardekooper, Sijme-Jan; Reiners, Ansgar; Rodríguez, Eloy; Rodrίguez-López, Cristina; Sarmiento, Luis F.; Strachan, John P.; Tsapras, Yiannis; Tuomi, Mikko; Zechmeister, Mathias (August 25, 2016), "A terrestrial planet candidate in a temperate orbit around Proxima Centauri" (PDF), Nature, 536 (7617): 437–440, arXiv: 1609.03449 , Bibcode:2016Natur.536..437A, doi:10.1038/nature19106, PMID 27558064 , retrieved August 24, 2016. ↑ "Planet found in habitable zone around nearest star". European Southern Observatory. August 24, 2016. Retrieved September 6, 2016. ↑ "Found! Potentially Earth-like planet at Proxima Centauri is closest ever". Space.com. April 24, 2016. 1 2 Chang, Kenneth (August 24, 2016). "One star over, a planet that might be another Earth". New York Times . Retrieved August 24, 2016. 1 2 Knapton, Sarah (August 24, 2016). "Proxima b: Alien life could exist on 'second Earth' found orbiting our nearest star in Alpha Centauri system". The Telegraph. Telegraph Media Group . Retrieved August 24, 2016. 1 2 Tarter, Jill C., Mancinelli RL, Aurnou JM, Backman DE, Basri GS, Boss AP, Clarke A, Deming D (2007). "A reappraisal of the habitability of planets around M dwarf stars". Astrobiology . 7 (1): 30–65. arXiv: astro-ph/0609799 . Bibcode:2007AsBio...7...30T. doi:10.1089/ast.2006.0124. PMID 17407403. 1 2 Khodachenko, Maxim L., Lammer H, Grießmeier J, Leitner M, Selsis F, Eiroa C, Hanslmeier A, Biernat HK (2007). "Coronal Mass Ejection (CME) activity of low mass M stars as an important factor for the habitability of terrestrial exoplanets. I. CME impact on expected magnetospheres of earth-like exoplanets in close-in habitable zones". Astrobiology. 7 (1): 167–184. Bibcode:2007AsBio...7..167K. doi:10.1089/ast.2006.0127. PMID 17407406. 1 2 Kürster, M.; Hatzes, A. P.; Cochran, W. D.; Döbereiner, S.; Dennerl, K.; Endl, M. (1999). "Precise radial velocities of Proxima Centauri. Strong constraints on a substellar companion". Astronomy & Astrophysics Letters. 344: L5–L8. arXiv: astro-ph/9903010 . Bibcode:1999A&A...344L...5K. 1 2 Schroeder, Daniel J.; Golimowski, David A.; Brukardt, Ryan A.; Burrows, Christopher J.; Caldwell, John J.; Fastie, William G.; Ford, Holland C.; Hesman, Brigette; Kletskin, Ilona; Krist, John E.; Royle, Patricia; Zubrowski, Richard. A. (2000). "A Search for Faint Companions to Nearby Stars Using the Wide Field Planetary Camera 2". The Astronomical Journal. 119 (2): 906–922. Bibcode:2000AJ....119..906S. doi:10.1086/301227. ↑ Innes, R. T. A. (October 1915). "A Faint Star of Large Proper Motion". Circular of the Union Observatory Johannesburg. 30: 235–236. Bibcode:1915CiUO...30..235I. This is the original Proxima Centauri discovery paper. 1 2 Glass, I. S. (July 2007). "The discovery of the nearest star". African Skies . 11: 39. Bibcode:2007AfrSk..11...39G. ↑ Glass, I.S. (2008). Proxima, the nearest star (other than the Sun). Cape Town: Mons Mensa. Retrieved September 6, 2016. ↑ Queloz, Didier (November 29, 2002). "How Small are Small Stars Really?". European Southern Observatory. eso0232; PR 22/02. Retrieved January 29, 2018. 1 2 Alden, Harold L. (1928). "Alpha and Proxima Centauri". Astronomical Journal. 39 (913): 20–23. Bibcode:1928AJ.....39...20A. doi:10.1086/104871. ↑ Voûte, J. (1917). "A 13th magnitude star in Centaurus with the same parallax as α Centauri". Monthly Notices of the Royal Astronomical Society . 77 (9): 650–651. Bibcode:1917MNRAS..77..650V. doi:10.1093/mnras/77.9.650. ↑ Clavin, Whitney; Harrington, J.D. (April 25, 2014). "NASA's Spitzer and WISE telescopes find close, cold neighbor of Sun". NASA . Archived from the original on April 26, 2014. Retrieved April 25, 2014. ↑ Shapley, Harlow (1951). "Proxima Centauri as a flare star". Proceedings of the National Academy of Sciences of the United States of America. 37 (1): 15–18. Bibcode:1951PNAS...37...15S. doi:10.1073/pnas.37.1.15. PMC 1063292 . PMID 16588985. ↑ Kroupa, Pavel; Burman, R. R.; Blair, D. G. (1989). "Photometric observations of flares on Proxima Centauri". PASA. 8 (2): 119–122. Bibcode:1989PASAu...8..119K. doi:10.1017/S1323358000023122. ↑ Haisch, Bernhard; Antunes, A.; Schmitt, J. H. M. M. (1995). "Solar-like M-class X-ray flares on Proxima Centauri observed by the ASCA satellite". Science. 268 (5215): 1327–1329. Bibcode:1995Sci...268.1327H. doi:10.1126/science.268.5215.1327. PMID 17778978. 1 2 3 Guedel, M.; Audard, M.; Reale, F.; Skinner, S. L.; Linsky, J. L. (2004). "Flares from small to large: X-ray spectroscopy of Proxima Centauri with XMM-Newton". Astronomy and Astrophysics. 416 (2): 713–732. arXiv: astro-ph/0312297 . Bibcode:2004A&A...416..713G. doi:10.1051/0004-6361:20031471. ↑ IAU Working Group on Star Names (WGSN), International Astronomical Union, retrieved May 22, 2016. ↑ "Naming Stars". IAU.org. Retrieved March 3, 2018. ↑ "Proxima Centauri UV flux distribution". ESA/Laboratory for Space Astrophysics and Theoretical Physics. Retrieved July 11, 2007. ↑ Kaler, Jim. "Rigil Kentaurus". University of Illinois. Retrieved August 3, 2008. ↑ Howard, Ward S.; Tilley, Matt A.; Corbett, Hank; Youngblood, Allison; Loyd, R. O. Parke; Ratzloff, Jeffrey K.; Law, Nicholas M.; Fors, Octavi; Del Ser, Daniel; Shkolnik, Evgenya L.; Ziegler, Carl; Goeke, Erin E.; Pietraallo, Aaron D.; Haislip, Joshua (2018). "The First Naked-eye Superflare Detected from Proxima Centauri". The Astrophysical Journal. 860 (2): L30. arXiv: 1804.02001 . Bibcode:2018ApJ...860L..30H. doi:10.3847/2041-8213/aacaf3. ↑ Kamper, K. W.; Wesselink, A. J. (1978). "Alpha and Proxima Centauri". Astronomical Journal. 83: 1653–1659. Bibcode:1978AJ.....83.1653K. doi:10.1086/112378. ↑ Binney, James; Scott Tremaine (1987). Galactic dynamics. Princeton, New Jersey: Princeton University Press. p. 8. ISBN 978-0-691-08445-9. ↑ Leggett, S. K. (1992). "Infrared colors of low-mass stars". Astrophysical Journal Supplement Series. 82 (1): 351–394, 357. Bibcode:1992ApJS...82..351L. doi:10.1086/191720. ↑ "Proxima Centauri Might Be More Sunlike Than We Thought". Smithsonian Insider. October 12, 2016. Retrieved November 2, 2016. ↑ Queloz, Didier (November 29, 2002). "How Small are Small Stars Really?". European Southern Observatory. Retrieved September 5, 2016. ↑ Zurlo, A.; Gratton, R.; Mesa, D.; Desidera, S.; Enia, A.; Sahu, K.; Almenara, J. -M.; Kervella, P.; Avenhaus, H.; Girard, J.; Janson, M.; Lagadec, E.; Langlois, M.; Milli, J.; Perrot, C.; Schlieder, J. -E.; Thalmann, C.; Vigan, A.; Giro, E.; Gluck, L.; Ramos, J.; Roux, A. (2018). "The gravitational mass of Proxima Centauri measured with SPHERE from a microlensing event". Monthly Notices of the Royal Astronomical Society. 480 (1): 236. arXiv: 1807.01318 . Bibcode:2018MNRAS.480..236Z. doi:10.1093/mnras/sty1805. ↑ Zombeck, Martin V. (2007). Handbook of space astronomy and astrophysics (Third ed.). Cambridge, UK: Cambridge University Press. p. 109. ISBN 978-0-521-78242-5. ↑ Benedict, G. F., McArthur, B., Nelan E, Story D, Whipple AL, Shelus PJ, Jefferys WH, Hemenway PD, Franz OG (1998). "Photometry of Proxima Centauri and Barnard's Star using Hubble Space Telescope fine guidance sensor 3: a search for periodic variations". The Astronomical Journal. 116 (1): 429–439. arXiv: astro-ph/9806276 . Bibcode:1998AJ....116..429B. doi:10.1086/300420. ↑ Suárez Mascareño, A.; Rebolo, R.; González Hernández, J. I.; Esposito, M. (September 2015). "Rotation periods of late-type dwarf stars from time series high-resolution spectroscopy of chromospheric indicators". Monthly Notices of the Royal Astronomical Society. 452 (3): 2745–2756. arXiv: 1506.08039 . Bibcode:2015MNRAS.452.2745S. doi:10.1093/mnras/stv1441. ↑ Yadav, Rakesh K.; et al. (December 2016). "Magnetic Cycles in a Dynamo Simulation of Fully Convective M-star Proxima Centauri". The Astrophysical Journal Letters. 833 (2): 6. Bibcode:2016ApJ...833L..28Y. doi:10.3847/2041-8213/833/2/L28. L28. ↑ Staff (August 30, 2006). "Proxima Centauri: the nearest star to the Sun". Harvard-Smithsonian Center for Astrophysics. Retrieved July 9, 2007. ↑ E. F., Guinan; Morgan, N. D. (1996). "Proxima Centauri: rotation, chromospheric activity, and flares". Bulletin of the American Astronomical Society. 28: 942. Bibcode:1996AAS...188.7105G. ↑ Wargelin, Bradford J.; Drake, Jeremy J. (2002). "Stringent X-ray constraints on mass loss from Proxima Centauri". The Astrophysical Journal. 578 (1): 503–514. Bibcode:2002ApJ...578..503W. doi:10.1086/342270. ↑ Stauffer, J. R.; Hartmann, L. W. (1986). "Chromospheric activity, kinematics, and metallicities of nearby M dwarfs". Astrophysical Journal Supplement Series. 61 (2): 531–568. Bibcode:1986ApJS...61..531S. doi:10.1086/191123. ↑ Cincunegui, C.; Díaz, R. F.; Mauas, P. J. D. (2007). "A possible activity cycle in Proxima Centauri". Astronomy and Astrophysics. 461 (3): 1107–1113. arXiv: astro-ph/0703514 . Bibcode:2007A&A...461.1107C. doi:10.1051/0004-6361:20066027. ↑ Wood, B. E.; Linsky, J. L.; Muller, H.-R.; Zank, G. P. (2000). "Observational estimates for the mass-loss rates of Alpha Centauri and Proxima Centauri using Hubble Space Telescope Lyman-alpha spectra". Astrophysical Journal. 537 (2): L49–L52. arXiv: astro-ph/0011153 . Bibcode:2000ApJ...537..304W. doi:10.1086/309026. ↑ Perryman, M. A. C.; Lindegren, L.; Kovalevsky, J.; Hoeg, E.; Bastian, U.; Bernacca, P. L.; Crézé, M.; Donati, F.; Grenon, M.; Grewing, M.; van Leeuwen, F.; van der Marel, H.; Mignard, F.; Murray, C. A.; Le Poole, R. S.; Schrijver, H.; Turon, C.; Arenou, F.; Froeschlé, M.; Petersen, C. S. (July 1997), "The Hipparcos catalogue", Astronomy and Astrophysics, 323: L49–L52, Bibcode:1997A&A...323L..49P. ↑ Williams, D. R. (February 10, 2006). "Moon fact sheet". NASA. Retrieved October 12, 2007. ↑ Benedict, G. F.; Mcarthur, B.; Nelan, E.; Story, D.; Jefferys, W. H.; Wang, Q.; Shelus, P. J.; Hemenway, P. D.; Mccartney, J.; Van Altena, Wm. F.; Duncombe, R.; Franz, O. G.; Fredrick, L. W. Astrometric stability and precision of fine guidance sensor #3: the parallax and proper motion of Proxima Centauri (PDF). Proceedings of the HST calibration workshop. pp. 380–384. Retrieved July 11, 2007. 1 2 García-Sánchez, J.; Weissman, P. R.; Preston, R. A.; Jones, D. L.; Lestrade, J.-F.; Latham, D. W.; Stefanik, R. P.; Paredes, J. M. (2001). "Stellar encounters with the solar system" (PDF). Astronomy and Astrophysics. 379 (2): 634–659. Bibcode:2001A&A...379..634G. doi:10.1051/0004-6361:20011330. ↑ Bobylev, V. V. (March 2010). "Searching for stars closely encountering with the solar system". Astronomy Letters. 36 (3): 220–226. arXiv: 1003.2160 . Bibcode:2010AstL...36..220B. doi:10.1134/S1063773710030060. ↑ Bailer-Jones, C. A. L. (March 2015). "Close encounters of the stellar kind". Astronomy & Astrophysics. 575: 13. arXiv: 1412.3648 . Bibcode:2015A&A...575A..35B. doi:10.1051/0004-6361/201425221. A35. ↑ Allen, C.; Herrera, M. A. (1998). "The galactic orbits of nearby UV Ceti stars". Revista Mexicana de Astronomia y Astrofisica. 34: 37–46. Bibcode:1998RMxAA..34...37A. ↑ Grimley, Peter (December 22, 2016). "Orbit of Proxima Centauri Determined After 100 Years". European Southern Observatory. Retrieved December 26, 2016. ↑ Kroupa, Pavel (1995). "The dynamical properties of stellar systems in the Galactic disc". MNRAS. 277 (4): 1507–1521. arXiv: astro-ph/9508084 . Bibcode:1995MNRAS.277.1507K. doi:10.1093/mnras/277.4.1507. 1 2 Wertheimer, Jeremy G.; Laughlin, Gregory (2006). "Are Proxima and α Centauri gravitationally bound?". The Astronomical Journal . 132 (5): 1995–1997. arXiv: astro-ph/0607401 . Bibcode:2006AJ....132.1995W. doi:10.1086/507771. ↑ Feng, F.; Jones, H. R. A. (January 2018), "Was Proxima captured by Alpha Centauri A and B? ", Monthly Notices of the Royal Astronomical Society, 473 (3): 3185−3189, arXiv: 1709.03560 , Bibcode:2018MNRAS.473.3185F, doi:10.1093/mnras/stx2576. ↑ Johnston, Kathryn V.; Hernquist, Lars; Bolte, Michael (1996). "Fossil signatures of ancient accretion events in the halo". The Astrophysical Journal. 465: 278. arXiv: astro-ph/9602060 . Bibcode:1996ApJ...465..278J. doi:10.1086/177418. ↑ Matson, John (December 9, 2009). "WISE satellite set to map the infrared universe". Scientific American. Retrieved December 10, 2009. ↑ Li, Yiting; et al. (December 14, 2017). "A Candidate Transit Event around Proxima Centauri". Research Notes of the AAS . 1 (1). 49. arXiv: 1712.04483 . Bibcode:2017RNAAS...1a..49L. doi:10.3847/2515-5172/aaa0d5. 1 2 3 4 5 6 7 Wall, Mike (April 12, 2019). "Possible 2nd Planet Spotted Around Proxima Centauri". Space.com. Retrieved April 12, 2019. ↑ Bixel, A.; Apai, D. (February 21, 2017). "Probabilistic Constraints on the Mass and Composition of Proxima b". The Astrophysical Journal Letters. 836 (2): L31. arXiv: 1702.02542 . Bibcode:2017ApJ...836L..31W. doi:10.3847/2041-8213/aa5f51. hdl:10150/623234. ISSN 2041-8205. ↑ "Proxima b is our neighbor ... better get used to it!". Pale Red Dot. August 24, 2016. Retrieved August 24, 2016. ↑ Aron, Jacob. August 24, 2016. Proxima b: Closest Earth-like planet discovered right next door. New Scientist. Retrieved August 24, 2016. ↑ "Follow a Live Planet Hunt!". European Southern Observatory. January 15, 2016. Retrieved August 24, 2016. ↑ Feltman, Rachel (August 24, 2016). "Scientists say they've found a planet orbiting Proxima Centauri, our closest neighbor". The Washington Post– via GALE. ↑ Mathewson, Samantha (August 24, 2016). "Proxima b By the Numbers: Possibly Earth-Like World at the Next Star Over". Space.com. Retrieved August 25, 2016. ↑ Witze, Alexandra (August 24, 2016). "Earth-sized planet around nearby star is astronomy dream come true". Nature. pp. 381–382. Bibcode:2016Natur.536..381W. doi:10.1038/nature.2016.20445 . Retrieved August 24, 2016. ↑ Liu, Hui-Gen; et al. (January 2018), "Searching for the Transit of the Earth-mass Exoplanet Proxima Centauri b in Antarctica: Preliminary Result", The Astronomical Journal, 155 (1): 10, arXiv: 1711.07018 , Bibcode:2018AJ....155...12L, doi:10.3847/1538-3881/aa9b86, 12. ↑ Endl, M. & Kürster, M. (2008). "Toward detection of terrestrial planets in the habitable zone of our closest neighbor: Proxima Centauri". Astronomy and Astrophysics . 488 (3): 1149–1153. arXiv: 0807.1452 . Bibcode:2008A&A...488.1149E. doi:10.1051/0004-6361:200810058. ↑ Saar, Steven H.; Donahue, Robert A. (1997). "Activity-related Radial Velocity Variation in Cool Stars". Astrophysical Journal. 485 (1): 319–326. Bibcode:1997ApJ...485..319S. doi:10.1086/304392. ↑ Schultz, A. B.; Hart, H. M.; Hershey, J. L.; Hamilton, F. C.; Kochte, M.; Bruhweiler, F. C.; Benedict, G. F.; Caldwell, John; Cunningham, C.; Wu, Nailong; Franz, O. G.; Keyes, C. D.; Brandt, J. C. (1998). "A possible companion to Proxima Centauri". Astronomical Journal. 115 (1): 345–350. Bibcode:1998AJ....115..345S. doi:10.1086/300176. ↑ Lurie, John C.; Henry, Todd J.; Jao, Wei-Chun; Quinn, Samuel N.; Winters, Jennifer G.; Ianna, Philip A.; Koerner, David W.; Riedel, Adric R.; Subasavage, John P. (November 2014). "The Solar Neighborhood. XXXIV. a Search for Planets Orbiting Nearby M Dwarfs Using Astrometry". The Astronomical Journal. 148 (5): 12. arXiv: 1407.4820 . Bibcode:2014AJ....148...91L. doi:10.1088/0004-6256/148/5/91. 91. 1 2 3 Billings, Lee (April 12, 2019). "A Second Planet May Orbit Earth's Nearest Neighboring Star". Scientific American. Retrieved April 12, 2019. ↑ Watanabe, Susan (October 18, 2006). "Planet-Finding by Numbers". NASA JPL. Retrieved July 9, 2007. ↑ Anglada, Guillem; Amado, Pedro J; Ortiz, Jose L; Gómez, José F; Macías, Enrique; Alberdi, Antxon; Osorio, Mayra; Gómez, José L; Itziar de Gregorio-Monsalvo; Pérez-Torres, Miguel A; Anglada-Escudé, Guillem; Berdiñas, Zaira M; Jenkins, James S; Jimenez-Serra, Izaskun; Lara, Luisa M; López-González, Maria J; López-Puertas, Manuel; Morales, Nicolas; Ribas, Ignasi; Richards, Anita M. S; Rodríguez-López, Cristina; Rodriguez, Eloy (2017). "ALMA Discovery of Dust Belts Around Proxima Centauri". The Astrophysical Journal. 850 (1): L6. arXiv: 1711.00578 . Bibcode:2017ApJ...850L...6A. doi:10.3847/2041-8213/aa978b. ↑ "Proxima Centauri's no good, very bad day". Science Daily. February 26, 2018. Retrieved March 1, 2018. ↑ MacGregor, Meredith A.; et al. (2018). "Detection of a Millimeter Flare From Proxima Centauri". Astrophysical Journal Letters. 855 (1): L2. arXiv: 1802.08257 . Bibcode:2018ApJ...855L...2M. doi:10.3847/2041-8213/aaad6b. ↑ Sandu, Oana; Hook, Richard (January 15, 2016). "Follow a live planet hunt!". European Southern Observatory. Retrieved January 18, 2016. ↑ Endl, M.; Kuerster, M.; Rouesnel, F.; Els, S.; Hatzes, A. P.; Cochran, W. D. (June 18–21, 2002). Deming, Drake (ed.). Extrasolar terrestrial planets: can we detect them already?. Conference Proceedings, Scientific Frontiers in Research on Extrasolar Planets. Washington, DC. pp. 75–79. arXiv: astro-ph/0208462 . Bibcode:2003ASPC..294...75E. ↑ Alpert, Mark (November 2005). "Red star rising". Scientific American. 293 (5): 28. doi:10.1038/scientificamerican1105-28. PMID 16318021 . Retrieved May 19, 2008. ↑ Ward, Peter D.; Brownlee, Donald (2000). Rare Earth: why complex life is uncommon in the universe. Springer Publishing. ISBN 978-0-387-98701-9. ↑ Gilster, Paul (2004). Centauri dreams: imagining and planning. Springer. ISBN 978-0-387-00436-5. ↑ Crawford, I. A. (September 1990). "Interstellar Travel: A Review for Astronomers". Quarterly Journal of the Royal Astronomical Society. 31: 377–400. Bibcode:1990QJRAS..31..377C. ↑ "Spacecraft escaping the Solar System", Heavens Above, retrieved December 25, 2016. 1 2 Beals, K. A.; Beaulieu, M.; Dembia, F. J.; Kerstiens, J.; Kramer, D. L.; West, J. R.; Zito, J. A. (1988). "Project Longshot, an Unmanned Probe to Alpha Centauri" (PDF). NASA-CR-184718. U. S. Naval Academy. Retrieved June 13, 2008. ↑ Merali, Zeeya (May 27, 2016). "Shooting for a star". Science . 352 (6289): 1040–1041. doi:10.1126/science.352.6289.1040. PMID 27230357. ↑ Popkin, Gabriel (February 2, 2017). "What it would take to reach the stars". Nature . 542 (7639): 20–22. Bibcode:2017Natur.542...20P. doi:10.1038/542020a. PMID 28150784. Wikimedia Commons has media related to Proxima Centauri . Nemiroff, R.; Bonnell, J., eds. (July 15, 2002). "Proxima Centauri: the closest star". Astronomy Picture of the Day . NASA . Retrieved June 25, 2008. "Proxima Centauri: the nearest star to the Sun". Chandra X-ray Observatory. Astronomy Picture of the Day. July 1, 2008. Retrieved July 1, 2008. James, Andrew (March 11, 2008). "A voyage to Alpha Centauri". The imperial star – Alpha Centauri. Southern Astronomical Delights. Retrieved August 5, 2008. "Alpha Centauri 3". SolStation. Retrieved August 5, 2008. 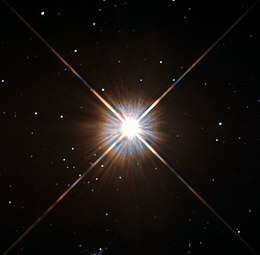 "O Sistema Alpha Centauri". Astronomia & Astrofísica (in Portuguese). Retrieved June 25, 2008. "Wikisky image of Proxima Centauri" . Retrieved July 1, 2017. "Proxima Centauri". Constellation guide. Retrieved August 25, 2016.